I have been planning to write an article on the controversy caused by Mahatma Gandhi’s racist comments during his time in Africa in my blog for some time now. But then I saw this article titled “Was Gandhi a Racist?” which was published in The Hindu on the 3rd of December 2016. This article is very well researched and informative and more importantly I no longer had any reason to write another article on a similar topic. But, there is a major inconsistency in the article which needs to be pointed out. I have pointed out this inconsistency and included some of my own observations on this article and the issue below the main article. On September 12, 2016, a group of academics at the University of Ghana submitted a petition to the members of the University Council asking for the removal of a Gandhi statue in its precincts. Four reasons cited as the rationale for the request stand out: one, Gandhi uttered racist remarks against indigenous Africans; two, in the absence of statues of African heroes, there was no reason to have a non-African’s statue in an African university; three, racist symbols at many universities have been removed; and four, there was no consultation with the stakeholders prior to erecting the statue. The latest news updates suggest that a decision has been taken for relocating the statue. But the key question remains: was Gandhi a racist? It is indeed true that Gandhi uttered racist remarks against native Africans within the dominant discourse on race and culture of the time. The Ghana University petition cites six racist utterances by Gandhi against indigenous Africans made between 1894 and 1906, but strangely, omits his revised views on Africans. His revised views, favourable to indigenous Africans, are located in his book Satyagraha in South Africa (1923-25), a historical narrative of the Indian struggle against racial discrimination in South Africa between 1894 and 1914. If Gandhi is castigated for his racist utterances, aren’t his revised opinions on native Africans equally noteworthy? There is, however, a catch here. Some scholars — most notably, Joseph Lelyveld and Arundhati Roy — have suggested that Gandhi’s change of mind about native Africans may not have been a true change of heart. For Lelyveld, Gandhi’s later utterances about native Africans, made in the 1930s, were intended at tidying up his disdain for the Blacks. For Roy, it was an attempt at becoming a South African hero by rescuing himself from his past racist utterances by rewriting history. But such a reading of Gandhi’s writings may not be borne out by historical evidence. Let us begin with Gandhi’s usage of the racist slur ‘kaffir’. The term ‘kaffir’ has Arabic roots and means ‘non-believer’. But it is present in the 10th edition of the scholarly Encyclopedia Britannica (1902) for referring to indigenous peoples of South Africa. The word appears no less than five times in the entry under the header ‘Anthropology’ authored by Edward Burnett Tylor. This demonstrates that ‘kaffir’ was in common usage at the time. If every utterance could be located within its corresponding linguistic context of the time, it is not surprising that ‘kaffir’ appears in the Collected Works of Mahatma Gandhi 456 times in the volumes 1-13 for the period between 1894 and 1913. But it is equally important to note that the term ‘kaffir’ does not appear thereafter in Gandhi’s writings. A change seems to have occurred in Gandhi’s beliefs on race around this period (1911-13). This metamorphosis in Gandhi’s perception of the African ‘race’ was the consequence of a series of events in the world of knowledge, which led to the decline of the paradigm of pseudo-scientific racism. Pseudo-scientific racism was the dominant paradigm of perceiving race and culture between 1880 and 1920. The paradigm classified humans according to physical characteristics of skin colour, body hair, hair texture, cranial measurements, and so forth. Those with similar physical features were then grouped to create a race identity. Thus were created Mongoloids, Caucasians, Blacks and so on. These groups were then hierarchically ordered into superior and inferior races. The paradigm of pseudo-scientific racism also linked race with culture. As a ‘race’ of people was the author of the culture in which that particular race was immersed in, the belief of a superior race producing a superior culture and an inferior race creating an inferior culture gained credibility. The paradigm of pseudo-scientific racism thus created a hierarchical ordering of not only race but also of culture. The Europeans located themselves at the top of this scale while certain groups of native Africans found themselves at the bottom. By the early 20th century, this paradigm of pseudo-scientific racism began to wear thin. Gandhi’s changing perceptions of race and culture coincided with the decline of this paradigm of knowledge about race and culture. The evidence for this hypothesis is compelling. Around 1907, Gandhi encountered Jean Finot’s Race Prejudice (English translation of the French original). Finot critiqued ‘race’ as a pseudo-scientific concept by demonstrating that human physical characteristics were partly products of the milieu. He insisted that race was an invented fiction because it cannot survive impartial scientific scrutiny. A few years after the publication of his work, Finot participated in the Universal Races Congress convened at the University of London in July 1911. One of the aims of this Congress was to define the term ‘race’. This Congress recognised the irreconcilability of the contention that some peoples were superior to others and eventually resolved to reject the extant meaning of ‘race’ altogether. One of the papers presented at the Congress was authored by the Jewish-American anthropologist Franz Boas. In that paper titled The Instability of Human Types, Boas argued on the basis of empirical observations that ‘races’ were not stable groups because different individuals belonging to the same race could have different physical characteristics due to geographical and social conditions. If races were not stable groups, then the belief in the innate superiority/ inferiority of races was untenable. The Universal Races Congress of 1911 is, therefore, an important milestone in the history of race studies. Amongst its promoters included Edward Blyden, W.E.B. Du Bois, Emile Durkheim, Olive Schreiner, Max Weber, and M.K. Gandhi. A few years after the conference, Gandhi left South Africa for good and spent the remainder of his life in India. Within a span of seven years after his return to India in 1914, Gandhi transformed from being a supporter of the British Empire into a staunch anti-imperialist. This transition opened Gandhi’s eyes to the relation between power and knowledge, and specifically, between imperialism and racism as well as imperialism and culture. Gandhi’s anti-imperialism extended from politics to aesthetics. He chastised the Indian yearning for a sharp nose and fair complexion as an imperial inheritance of a people whose minds and cultural values were colonised by the Europeans. These European ideals of beauty were, in his words, “a superstition”. From Gandhi’s transformed perspective, indigenous Africans were no longer savages nor barbarians but so imagined by the observer’s vanity. Strangely, the petition submitted by the Ghana academics omitted the transformation of Gandhi. But, it contains a pertinent question: How can historians and teachers in the Humanities and Social Sciences explain Gandhi’s uncharitable attitude towards the ‘Black race’? Gandhi was indeed uncharitable to indigenous Africans but only in the early part of his career. He underwent an intellectual moulting and his transformed world view altered his own perceptions of other ‘races’ and cultures. Gandhi is not an isolated example. When we look at the history of race relations since the European discovery of America, we see that perceptions by individuals of peoples most distinct from themselves have transformed over time corresponding to their own individual experiences. Let us look at two well-known individuals who led socially engaged lives at the extremities of the Modern period: Bartolome de Las Casas at its beginning and Fernando Ortiz towards the end. Friar Bartolome de Las Casas O.P. (1474-1566) once described Native Americans as encomenderos but later became the most vociferous champion of their rights. In his hurried search for a solution to the rapid decline of the indigenous population as a consequence of the Spanish conquest and colonisation of Mesoamerica, Las Casas even suggested that Native American slaves be substituted by “robust” African slaves, only to rue ever having made that suggestion on realising that the Blacks were perishing as fast as the indigenous people of America. The other case of a transformed individual is Fernando Ortiz (1881-1969), who was a Creole scholar of Afro-Cubans. His early writings on Afro-Cuban sorcerers and slaves were not only ethnocentric but racially prejudiced against Afro-Cubans. Ortiz described Afro-Cuban slaves as lascivious and being inclined towards anthropophagi. He characterised their religion as amoral and criminal and called for exterminating it. These early studies of Ortiz were influenced by positivist criminology — the dominant school of thought of the time. Ortiz underwent a process of intellectual moulting, rejected his own racial prejudices, and eventually became the most celebrated scholar of Afro-Cubans. Las Casas, Gandhi, and Ortiz were indeed champions of oppressed peoples and cultures. Like other ordinary individuals they too suffered from prejudices prevalent in their environment. What made them extraordinary was the manner in which they transcended these irrational prejudices. I accept the basic argument made in this article that the reason why there is now outrage over Gandhi’s “racist” statements in some African countries is because they have been read out of historical context and are a result of selective reading and understanding of Gandhi and history. But I do not think this article gives enough space for the African unconsciousness. Strangely enough I have attained a new and better understanding of this African unconsciousness after playing a video game- Assassin’s Creed: Black Flag. It is a 3 years old game but it is very well made and I will write a review for it soon. In a DLC released for this game called “Freedom Cry”, the player, plays as a former slave from Africa who is washed ashore into Port au Prince (the modern day capital of Haiti) in the 18th century which is correctly shown as a slave trading hub. The Africans in this island could be found mostly in three places- working in the plantations as slaves, beings sold in the markets as slaves and being kept in cages under the watchful eyes of jailers before being sold as slaves. Basically all the movement of the black people within this island was under the supervision of some authority or another. As a player in this game you are tasked to complete some secret missions. But whenever someone sees you (a black person) unsupervised they will shout out “Criminal”and people will try to catch you, beat you up or worse. This was in sharp contrast to the main game where the player plays as a white Welsh privateer who did not face such problems. Although the above mentioned kind of Africa based slave trade came to an end by the mid 19th century but in those countries where apartheid or other forms of racial segregation was practised like in South Africa, Africans found in areas outside the ones where they were designated to be in were legally prosecuted as criminals. So, one of the very basic freedoms that human beings desire- the freedom of movement was denied to Africans because of their skin colour. So in large parts of the world restrictions on freedom of movement based on skin colour was legally implemented for 300 years till about a quarter of a century back (when apartheid was abolished in South Africa). Now let us come to Gandhi’s movement in South Africa. 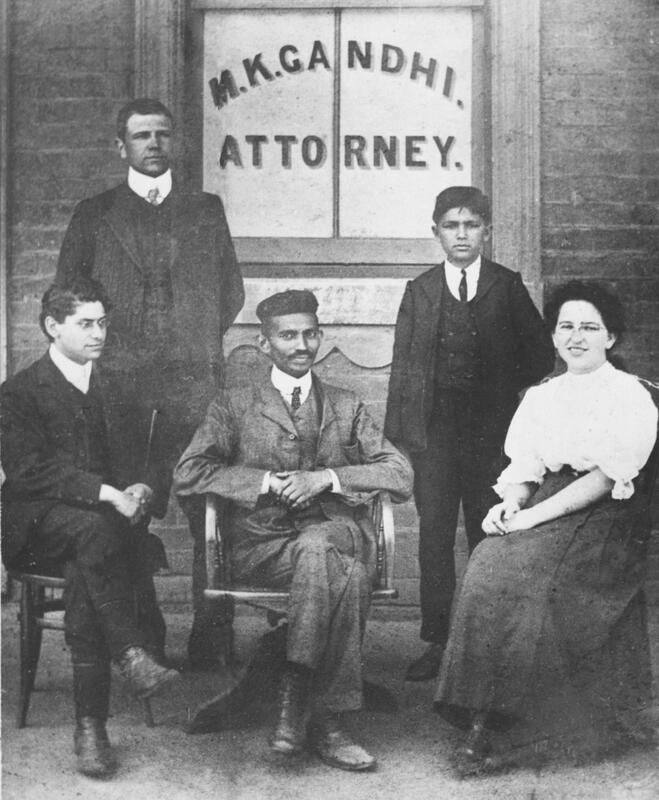 MK Gandhi’s movement in South Africa was exclusively meant to address the problems faced by Indians due to discriminatory race laws. There were no Africans in the leadership positions and support to the rank and file from the Africans was scant. Hence Gandhi’s movement in Africa was an ethnic movement meant to address the concerns of a particular community. But was this movement based on the idea of equality of everyone? No, it was based on the assertion that Indians should be treated in the same ways Europeans are and not the way Africans are treated. In fact Gandhi himself complained when he was locked up in jail with African prisoners for being meted out treatment not suitable for his stature. But was this movement successful, after all apartheid was done away with only in 1990 in South Africa? Here lies the main caveat. This movement lead by MK Gandhi was not a total success but remained the most successful civil rights movement for almost a century in South Africa as a result of which from the end of Gandhi’s movement in South Africa till the abolition of apartheid there, Indians enjoyed far greater rights than the Africans. Now just add what you read in the above paragraph with this paragraph. What do you get? We get an Indian community which enjoyed more rights than Africans and assume themselves to be superiors to the Africans. We also get an African community which found itself in a three tier caste system where they were relegated to the bottom rank and were subjected to racial discrimination by their own countrymen of both European and Indian descent. Now, I greatly admire Mahatma Gandhi as a politician. Not because of any of the spiritual teachings or because of his stands on non-violence (because I think were all over the place- but that is an issue for a later article) but because he was constantly ready to learn and correct his ways and most importantly bring himself to understand that what he had assumed to be right may in fact be wrong. Of course a lot of his final political, economic or social ideas were far from ideal but we cannot deny that we are at a better place now because Gandhi was able to realise that he was wrong and had to correct his way, many times. Just take a moment to compare and contrast between these two Gandhis- the Gandhi who at the end of the 19th century decided to go to South Africa thinking that the most important duty of a man is to be a loyal servant of the British crown- and the Gandhi in the early 1940s who believed that any and all means should be used to uproot the British government from India (except maybe supporting SC Bose). In the same way, Gandhi changed, modified and improved his understanding of caste, religion and race. He not only became convinced of equality of everyone but the Poona Pact with Ambedkar showed that he was ready to accept the principle of equal opportunity as well. But the important thing to note here is that these changes and improvements in Gandhi’s thoughts took place in India even though many of his foundational beliefs regarding how to run a political movement took shape when he was in Africa. Yes, I accept the contention and evidence of the writers of the above quoted article as authentic. But again those changes in Gandhi’s perception of race relations did not take place in Africa but in India where he did what he could to act on his new found beliefs. But unfortunately the Africans were left with the remnants of his earlier beliefs which ended up creating the above mentioned three tier caste system based on race with them at the bottom of it. Now, let me point out the inconsistency in the article that I talked about in the beginning of this blog post. It has to do with the authors’ attempt to compare Gandhi with Bartolome de Las Casas and Fernando Ortiz . Both of these people were once racist and then condemned their own earlier racist views and worked for the upliftment of the native people of Latin America and people of African origin in Latin America. But both de Las Casas and Ortiz worked for the betterment of the people against whom they once held racist views while living amongst them. But similar levels of absolution and atonement is missing from Gandhi’s tale (maybe for obvious reasons- like his full time commitment to the Indian freedom struggle). In conclusion, I would like to say that we should not stand in judgement of or preach to the Africans regarding what they do or don’t do with the legacy of the MK Gandhi, but we can just suggest to them that they take a holistic view of history. At the same time we should also learn to accept the historical responsibility of the actions and words of the father of our nation. Previous Demonetization:Why it is not about “Black Money” and Why the Government had to do it? As a young man I understand Gandhi was given to meat eating in the belief that he too could be seen as a ferocious handlebars moustachioed Englishman. Monish has written a fine article on this amazing pacifist and politician, who made a great study of Ahimsha and Satyagraha.